The Green Sanctuary: What is Lumbago ? Lumbago is an umbrella term for lower back pain, which can be caused by a variety of issues from sudden strain to tumors. There are a number of treatments for lumbago, depending on the root cause, including surgical options for very severe cases. Low back pain affects many people at some point during their lives, and it is a frequently cited cause for missed work. Because the causes for lumbago vary, it is important to see a doctor if you have any type of back pain, to ensure that the cause is properly diagnosed so that you get the right treatment. 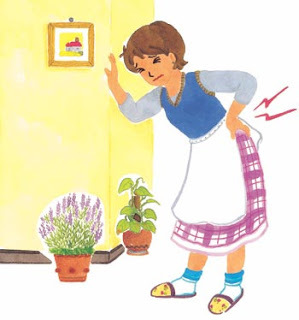 The most obvious symptom of lumbago is, of course, lower back pain which may radiate into the upper legs. Patients may also experience stiffness in their lower backs, especially when rising in the morning, along with painful muscle spasms in the lower back. A tingling sensation in the lower legs and feet sometimes accompanies lumbago as well, and patients may develop a spinal curvature as their bodies respond to the pain. Strain is a common cause of lower back pain; a common cause of strain is an activity like heavy lifting without proper support. Lumbago can also be caused by arthritis, osteoporosis, scoliosis, tumors, and herniated discs, among other things. A doctor will be able to diagnose the condition and determine the underlying cause with the assistance of diagnostic tools. In addition to a physical examination, a doctor may use diagnostic equipment like x-ray and MRI machines to visualize the spine in an attempt to find the source of the lumbago. There are an assortment of nonsurgical treatments for lumbago, including exercise and gentle stretches for the back, anti-inflammatories and painkillers to ease the swelling and pain associated with the condition, and the use of antidepressants to treat the mental discomfort which sometimes accompanies back pain. Some doctors also recommend spinal manipulation or massage to ease lumbago, along with treatments like acupuncture. Application of hot or cold compresses can sometimes help as well. In some cases, the condition may require surgery. This is often true of lumbago caused by damage to the spine, or chronic lumbago which keeps recurring. Surgical options vary depending on the cause of the lower back pain, and surgeons usually discuss the available choices carefully with their patients. Surgery can restore the integrity of the spine, ideally while preserving the patient's mobility and flexibility. Back pain can be frustrating, and also potentially very dangerous if it is not treated. There are a number of different causes for back pain, some of which can be avoided. In many cases, back pain will resolve after several days of rest and gentle treatment, although this is not guaranteed. If you are experiencing extreme or prolonged back pain, you should consult a doctor immediately. One of the leading causes of back pain is strain. Improper body mechanics, posture, and lifting practices can lead to strain, especially in the lumbar or lower back. A ruptured or herniated disc can also cause back pain, as will a slipped disc. Elderly individuals may be at risk of arthritis and osteoporosis, both of which can cause back pain. In addition, older people are more prone to spinal stenosis, a tightening of the spinal canal. Some infections and inflammations can result in back pain as well. Severe trauma such as falls and car accidents is another source of back pain. For simple back pain, rest is sometimes the best cure. Applications of ice and heat may also help, as will some topical rubs. For more extreme back pain, surgery, medication, and physical therapy may be in order. A doctor will decide on the best course of treatment to pursue once he or she has determined what is causing the back pain. Sometimes, this may require an exhausting round of tests, since the spine is very complex and the reason behind back pain is not always readily apparent, especially when the patient has limited information. Several things can help patients avoid back pain. For people in positions which require lifting, proper training should be received on how to lift and handle material. Appropriate braces may need to be worn as well to support the back. Regular exercise and a healthy diet to keep the spine strong and flexible are also useful. Some doctors may recommend regular massage or physical therapy as well, to help patients keep fit. By taking good care of your body, you may be able to avoid back pain, especially serious back pain. If you experience a mild case of back pain, rest in bed and try to minimize strain on your back. Prolonged or intense pain is a sign that you need to see a doctor, as is numbness or tingling in the extremities. Do not hesitate to seek professional attention for back pain, since it is better to be safe than sorry.